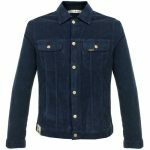 There seems to be a lot of Ramones-related merchandise doing the rounds these days – but with most of the band dead, I guess there’s very little in the way of objection. Converse are the latest company to jump on this particular bandwagon, producing the Ramones-themed Converse Chuck Taylor. The Red Chuck Taylor (to give it the official name) are made of distressed denim – just like the brothers’ jeans. 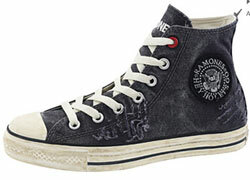 It also features a Ramones logo ankle patch on one side, with the Converse logo on the other, as well as the band name embroidered on the tongue and Converse ‘Red’ detailing. You can pick them up on the Converse site for $61.99 (around £32). como puedo hacer para conseguir las converse de los ramones si vivo en la argentina?